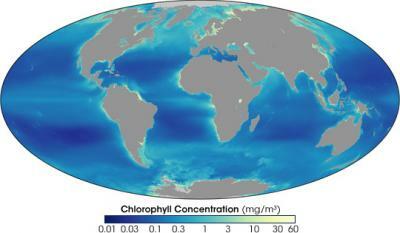 The distribution of plants in the ocean is driven by currents and temperature. Surface currents around the Equator, for example, push away from each other (diverge), creating a well where nutrient-rich water can rise to the surface. Plants flourish in the combination of sunlight and nutrients, as illustrated by the pale blue band that circles the Earth at the Equator.